Artful gardeners are always on the lookout for wonderful new plants to enliven beds and borders. Indoors or out, arranging colorful combinations is greatly simplified when we use quantities of long bloomers, plants whose good looks hold for months on end. A recent returnee to the garden scene, Cerinthe major ‘Purpurascens’, is exactly the sort of tireless worker we need. Commonly called honeywort, this borage relative offers handsome foliage and stunningly colorful bracts that long outlast its small flowers. Like its kitchen cousin, honeywort’s flowers are tubular bells of intense blue or purple, delicately scalloped and lined in cream. The bells are clustered in twos and threes, each group nesting inside brilliantly blue bracts like overlapping fish scales. The true leaves are rounded like grapefruit spoons, lustrously grey-blue in color and as fleshy in texture as a succulent. The new growth is strikingly stippled with creamy stripes and flecks which fade to a subtle marbling as the leaves mature. Although grown in European pleasure gardens since the middle ages, Cerinthe has no known medicinal uses. According to his famous book, ‘The Herbal’, its ornamental qualities earned honeywort a place in John Gerard’s garden in the late 1500’s. Gerard liked to sip honey-flavored nectar from the tiny flowers, and noted that the leaves have the taste of “new wax” or fresh honeycomb as well. Since his day, however, honeywort fell from favor. It has never been a traditional border plant, for no prominent Victorian or Edwardian gardener mentions it. Indeed, it was unavailable in the seed trade until the recent reintroduction of a well-colored European garden selection. Native to the Mediterranean basin, wild honeywort displays a wide variation in color and form. Where Cerinthe major grows abundantly in open meadows and grassy plains in southern Italy and Greece, the flowers may be lavender, cream or pale yellow, sometimes neatly rimmed or striped with violet. The bracts may be a dull blue_green, soft or vividly blue, or warmly purple. In early summer, Greek fields of these common wildflowers are hazed with a pewtery slate blue, like a shimmering reflection of the hot summer sky. Seen as individuals in garden settings, honeywort plants are enchanting. The partially perfoliate leaves rise in whorls along branching stems which bend gracefully beneath their burden of blossoms and bracts. Garden grown plants vary a good deal in size and behavior. Those raised in lush, sunny settings may rise more than waist high, needing unobtrusive staking with twine and slim bamboo wands to keep them upright. Rich, open-textured soil and ample water make for an exceptional abundance of blossoms and bracts which retain their handsome appearance well into autumn. handsome herb is as drought tolerant as rosemary, sage or thyme. Even when grown in unimproved, sandy soils in full sun, honeywort will bloom early and often. Indeed, in damp shade, this sun lover languishes and may rot away before fulfilling its floral potential. However, honeywort makes a fuller and far more floriferous mound when given ordinary amounts of supplementary water. The blue bracted honeywort will particularly appeal to border colorists and flower arrangers, who are always on the lookout for good blues. This plant is especially fun to work with because it is a color changer, its bracts altering from royal blues and cloudy purples to tawny coppers and ruddy browns when backlit by slanting sun. Honeywort pairs dramatically with purple hazel, which shows the same tendency to crossover, its wide leaves shifting readily between mahogany and burgundy depending on the light. Honeywort also makes delightful company for flaming crocosmias like sizzling orange ‘Firebird’ and fire red ‘Lucifer’, as well as smoky ‘Salmon Leap’ Cape fuchsias (Phygelius x rectus). To emphasize its cascading lines, try placing it with tall, arching grasses such as maiden grass, Miscanthus sinensis. It also makes a splendid companion for ruddy, fox_colored Carex buchananii or the bronzed forms of Carex comans and C. filifera. To accentuate the murky color qualities of honeywort’s burnished bracts, interplant it with masses of purple_bronze Euphorbia dulcis ‘Chameleon’ and near_black chervil, Anthriscus sylvestris ‘Ravenswing’ or the pewtery purple form, ‘Moonlit Night’. The muted burgundy of shrubby Hypericum androsaemum ‘Albury Purple’ will echo tints in all this group of plants, rounding out the vignette with panache. 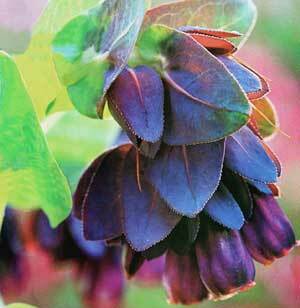 In certain parts of England, Cerinthe major ‘Purpurascens’ is said to be solidly hardy and evergreen to boot. Elsewhere, Cerinthe major is an annual, though the smaller, yellow-flowered Cerinthe minor is considered hardy to zone 5. Here in the Pacific Northwest, both commercial and home growers from southern British Columbia to California’s Bay Area have found Cerinthe major ‘Purpurascens’ to be an ardently self-sowing annual. Like ordinary borage, honeywort comes readily from its abundant seed. In the garden, however, the seeds tend to sprout in the fall and be killed by the first sharp frost. Because the seeds ripen irregularly, and because an explosive release mechanism often propels them a considerable distance from the mother plant, seed can be tricky to collect. One good way is to check the ground beneath large plants every few days, gathering small handfuls of the cylindrical black seeds as they fall. It is also possible to harvest whole branches of blooming honeywort, bringing them inside to dry. Keep the branches lightly covered with cheesecloth or newspaper to keep the seed from shooting across the room as it dries. Although many seeds will be unripe when you gather the branches, most will ripen to maturity as the bracts wither. To save honeywort seed over the winter, place it in a clean, dry jar with a small packet of film dessicant. A tablespoon of dried milk powder, loosely wrapped in a square of cheesecloth, will similarly absorb moisture from the air, keeping the seeds properly dry until spring.